Eugene Irschick deftly questions the conventional wisdom that knowledge about a colonial culture is unilaterally defined by its rulers. 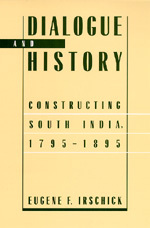 Focusing on nineteenth-century South India, he demonstrates that a society's view of its history results from a "dialogic process" involving all its constituencies. For centuries, agricultural life in South India was seminomadic. But when the British took dominion, they sought to stabilize the region by inventing a Tamil "golden age" of sedentary, prosperous villages. Irschick shows that this construction resulted not from overt British manipulation but from an intricate cross-pollination of both European and native ideas. He argues that the Tamil played a critical role in constructing their past and thus shaping their future. And British administrators adapted local customs to their own uses. Eugene F. Irschick is Professor of History at the University of California at Berkeley and author of Tamil Revivalism in the 1930s (1986).